A 15-mm incision is made in the lumbar triangle between the 12th rib and the iliac crest. Using a hemostat, the tissue is bluntly spread away until the anterior thoracoabdominal fascia is exposed. A finger or hemostat is used to penetrate through this fascial layer as well as the lumbodorsal fascia to enter the retroperitoneum. Using the finger for blunt dissection, the retroperitoneal space is developed anterior to the psoas muscle and posterior to the Gerota's fascia. A balloon dilator device is inserted to create a working space in the retroperitoneum. Typically, about 800 to 1000 mL of air is instilled into the balloon to displace the kidney anteromedially. The laparoscope can be inserted within the inflated transparent balloon to confirm appropriate balloon placement and adequate expansion of the retroperitoneum. 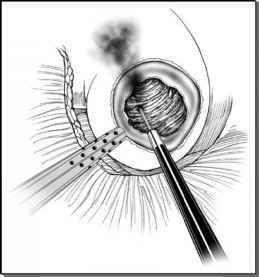 Following balloon dilation and removal, a 10-mm blunt tip trocar is placed as the primary port. After creation of pneumoretroperitoneum (15 mmHg) and the insertion of a 10-mm 30° laparoscope, the psoas muscle and Gerota's fascia are identified. Two secondary ports are placed under direct laparoscopic visualization. A 5-mm port is placed at lateral border of the erector spinae muscle just below the 12th rib (Fig. 2). Another 5mm port is placed at the anterior axillary line 2 cm below the costal margin. During insertion of the third port, care must be taken to prevent breaching of the peritoneum. If required, the lateral reflection of the peritoneum can be further mobilized anteromedially before the port is inserted.